Many of us enjoy travelling with our dogs and there’s nothing your dog loves more than hanging out with you. Just like us dogs need to be restrained properly during travel. We encourage all dog owners to familiarise themselves with the potential dangers of having an unrestrained animal in their Car or Ute. “Unrestrained animals can distract the driver and also become a hazard in the event of a collision causing injury to themselves and passengers”, “Dogs can jump out of cars due to fear or excitement, this often results in serious, painful injury or even death” says Dr Hudson who has seen far too many preventable accidents during his time as a veterinarian. Pets travelling in CARS:- In NSW it is illegal to drive with an animal on your lap. Travelling crate or cage secured to the car seat is probably the safest. These should have enough room for your pet to stand, lie down and turn around in. Harnesses which fit around your dog’s chest shoulders and back and then attach to seatbelts are effective. When using these ensure that the harness is fitted correctly and that your pet cannot get their head completely out of the window. 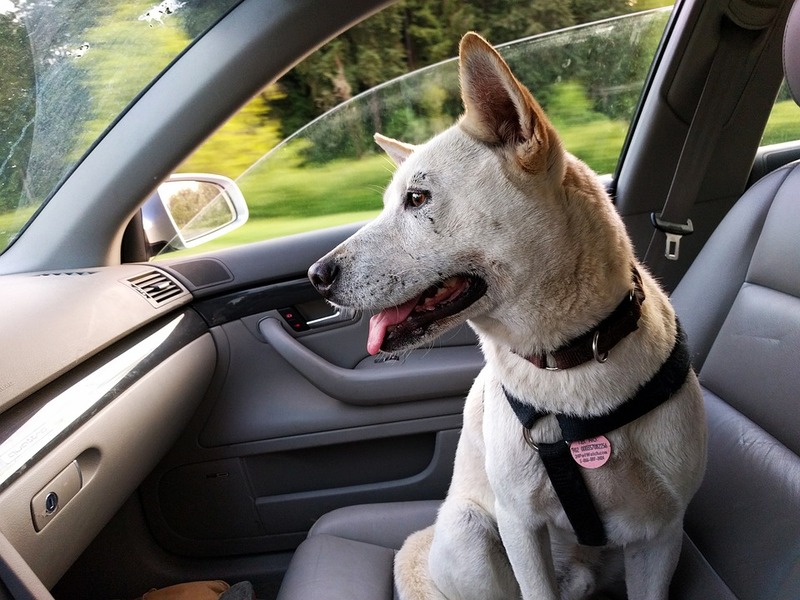 Be mindful that leaving animals unattended in cars can be extremely dangerous as the car can reach fatal temperatures in a short period of time. UTES:- Never allow your dog to roam freely around the tray of your Ute. Travelling Crate or Cage secured firmly to the back of the cabin is the safest for your dog. It is a good idea for this to have a weather proof roof on it in case of rain and to provide shade on hot sunny days. Use a harness which is correctly fitted around the dogs chest, shoulders and back, it is important that this will not slip off or come undone. Secure the harness with a strong lead or chain behind the cabin in the middle of the tray to protect from dust and wind. The length of tether should not allow the dog to reach the edges of the tray or become tangled however it should be long enough so that the dog can be able to move their head around. Be mindful that on hot days, the metal tray can become very hot and may burn the dog’s feet so make regular stops to check this, offer water and make sure the restraint is secure. Remember to secure any loose equipment to prevent it sliding around and injuring your dog. We hope you found this information useful and that you and your pet continue to have many safe journeys. If you have any questions or require any assistance regarding the safe travelling of your pets, purchasing crates, fitting harnesses or any other travelling equipment please call us on 6652-3455 and speak to one of our friendly team who are always happy to help.